Kolean Riedel, 79, of Gardner, KS passed away on October 2, 2016 at Wellsville Retirement Community. Private Graveside Inurnment will be 10:30 am Monday, October 10, 2016 at Gardner Cemetery, Gardner, KS. A family luncheon will be held in honor of Kolean at the Wellsville Retirement Comm. Memorial contributions may be made to Huntington’s Disease Foundation or the National Breast Cancer Foundation, Inc.
Kolean was born on September 29, 1937 in Abilene, Dickinson Co., KS to Charles Kenneth and Edna Mae (Gish) Kean. Kolean graduated from Colby High School in 1955. She married Richard Leroy Riedel on April 8, 1956 in Colby, Thomas Co, KS. Her first few years after high school were spent working for the telephone company in Colby, KS. She then went on to work for Cramers, Inc. in Gardner as a data processing clerk for 26 years before retirement. Kolean loved genealogy and was a member of the Daughters of the American Revolution and United Methodist Church in Colby. She was an avid sports fan. Kolean was a special wife, mother and friend and will be missed dearly. Kolean was preceded in death by her parents, Charles and Edna and brother-in-law, Ron Riedel. 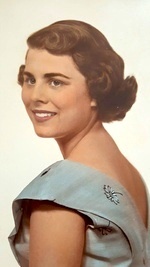 She is survived by her husband, Richard of Wellsville, KS; sons: Kevin Michael Riedel (Ann Klausing) of Southlake, TX and Kraig Alan Riedel of Lenexa, KS; former daughter-in-laws: Cindy Riedel and Debbie Walker; grandchildren: Ryan Michael Riedel, Joshua Alan Riedel, Nathan Sikes Riedel, Abigail Hope Riedel, Alexis Elaine Riedel and Madeline Kean Riedel; sisters: Barbara Jean Kean Faurot, Joy Ann Kean Kimsey (Forest), Cheryl Kay Kean Wells; sister-in-law’s: Kaylene Sue Crabb (Johnnie) and Kathleen Riedel and many nieces and nephews.